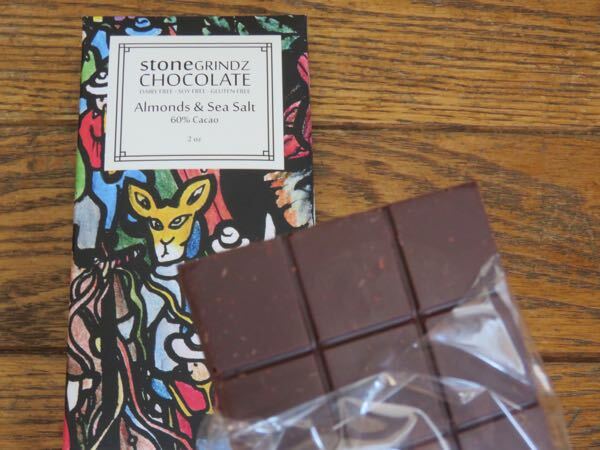 Today's Almonds and Sea Salt 60% Cacao bar (Batch #234) was made by Stone Grindz Chocolate (Scottsdale, AZ), a company that produces organic, bean-to-bar, small batch chocolate in their workshop in the Phoenix, Arizona area. 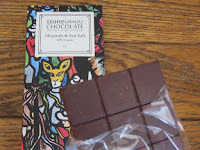 The smooth, rich chocolate was embedded with small crunchy pieces of roasted almonds that added a bit of texture and very subtle nut flavor. The light touch of sea salt was balanced and relatively even. This dark bar contained nuts (almonds), but no gluten, soy or dairy.